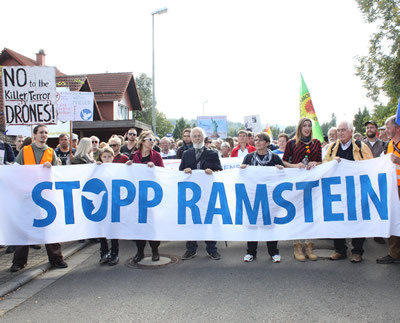 On the occasion of the sixtieth anniversary of the NATO military organisation, we appeal to all people to come to Strasbourg and Baden-Baden 2009, to protest against NATO’s aggressive military and nuclear policies, and assert our vision of a just world free of war. NATO is an increasing obstacle to achieving world peace. Since the end of the Cold War, NATO has reinvented itself as a tool for military action by the “international community”, including the promotion of the so-called “war on terror”. In reality it is a vehicle for US-led use of force with military bases on all continents, bypassing the United Nations and the system of international law, accelerating militarization and escalating arms expenditure – NATO countries account for 75% of global military expenditure. Pursuing that expansionist agenda since 1991, designed to advance strategic and resource interests, NATO has waged war in the Balkans, under the guise of so-called “humanitarian war”, and has waged seven years of brutal war in Afghanistan, where the tragic situation is escalating and the war has expanded into Pakistan. In Europe NATO is worsening tensions, feeding the arms race with so-called “missile defence”, a massive nuclear arsenal and a nuclear first strike policy. EU policy is increasingly tied to NATO. NATO’s ongoing and potential expansion into eastern Europe and beyond, and its “out of area” operations are making the world a more dangerous place. The conflict in the Caucasus is a clear indication of the dangers. Each advance of the NATO border increases the possibility of war, including the use of nuclear weapons. We call on you to spread this message in your communities and movements, to come to Strasbourg and Baden-Baden and to make this vision a reality. We believe that a world of peace is possible. 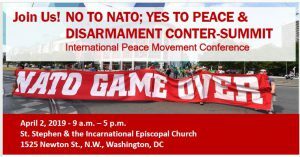 No to war – No to NATO. Signatures (as of March 2nd 2018).